8.8 Are there any downsides to this model? 14.6 What’s the quality of the pump? 14.7 Value for money – Is it worth it? 20.3 What’s the comfort level of this mattress? 20.5 Is air retention good? 20.7 So, what do we get for the money invested? 22 What happened in this update? Out of the 3 airbeds that are in this price range, 2 are currently also in the best rated overall, meaning that (apart from the luxury models that cost a few K) are the best airbeds out there. The SoundAsleep Dream Series has been dominating not only this category but most categories it’s featured in including, as we mentioned, the top rated overall. Take a moment to analyze the following table, it’s pretty much all you need to know if you don’t have the time to read the reviews. It is digest view of the the results these airbeds received based on: our in-house testing, how our features testers rated them and the updated user reviews. Only one other model is rated at 95/10 and that’s the Comfort A8, by Personal Comfort, but A8 belongs to the group of luxury air mattresses. Height 19 " 24 " 22 "
Every single air bed in this category undergoes a serious set of tests and user reviews until we get a single number, THE OVERALL RATING, we present to you, our readers. The point is making the whole thing as easy for you as possible. According to its whopping grades (94 – experts, 92 – testing, 94 – buyers), we would say it’s riveted to the 1st place for good reason. A 94/100 rating speaks volume about the longevity of this air bed. Another solid score here – 94/100. 94/100 means fast inflation/deflation without the unnecessary noise. Is a very striking feature when it comes to Dream Series, based on everything we’ve seen so far. Are there any downsides to this model? Customers did sound overjoyed with it, and it passed our tests with flying colors, but there are always some CONs we can point out for you. SoundAsleep Dream Series exists on two planes, as far as we’re concerned. In terms of sheer quality and performance, it’s right UP there with the biggest names in the industry. When it comes to price tags, however, it’s down there with pretty inexpensive models. That’s the most recognizable trait of the Dream Series – excellent quality at low prices. It’s every customer’s dream come true. 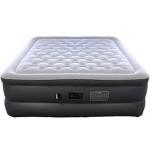 It stands tall and has better ratings inmost categories compared to even the airbeds from the price range above it that cost two or three times as much. The thing that caught our eye the most, however, was the fact that people predominantly use these air mattresses as their permanent beds. That sounded a bit off since SoundAsleep specifically says they’re made for periodical use only. The conclusion was that Dream Series CAN withstand constant use, the company just wanted to be safe in case they under perform in any way due to daily use. So, we can even use them as our permanent sleeping solution and they’ll perform excellently. As we already said, when we combine our expert ratings, user ratings and those of our featured tester, it’s no wonder this air mattress is riveted in the first place. Fox High rise managed to earn its place among the best cheap air mattresses simply by SELLING and getting a bunch of positive reviews in the nick of time. Fox can’t really compete with SoundAsleep with 88/100 in comfort. It does a pretty bang-up job of competing with everybody else, though. This is one comfortable air mattress! It keeps firm all night long, which is such a treat for my aching back. I can’t feel any pressure point while sleeping, and I wake up without sore muscles and stiff back and neck. It’s a lifesaver! The relevant grade here is 95, which means longevity is the main selling point for this fox air bed. 89 again, which tells us this Fox air bed can surely hold its air. 87/100 is a great success, but it lags a bit behind. Only a bit, though. Officially, it’s the number 2 air pump in this category, but it does some room for improvement. Value for money – Is it worth it? The question is a bit moot in our opinion. We ARE talking about number 2 product on one of our most popular categories. To say the competition is harsh is putting it mildly. This Fox air bed has two main things going for it above all else. People have reported using this model as their main or permanent bed, and it’s performing without a hitch. It’s not intended for permanent use, but buyers do it anyway. So, imagine just how strong and well-built it is if it can be used outside the intended scope. As far as the other factor is concerned, people report getting great discounts or often finding this air bed on sale. It’s a great opportunity to get one of the best cheap air mattresses even cheaper. The current price is a bit over 100 dollars. Durability part of the story is also backed-up by numerous tests we did over time. We were abusing this model relentlessly for 6 months, and it still held air afterward. Enough said. Second of our “last minute entries” to the list, Coleman’s Queen Airbed with cot sold like candy in the past two months. What’s the comfort level of this mattress? The comfort is the biggest forte of this model. Once we started testing it, we figured it’s no wonder people buy it with such intensity. With a very respectable grade of 88/100, this model is among the most durable cheap camping beds out there. This is my second Coleman with cot, and I bought it right after the first was done for. I had the first bed for more than 5 years!!! I used it as my primary bed, and it kept it together this whole time. Great air mattress at a great price! This particular model holds the highest grade in this department. 91/100 is definitely nothing to sneeze at, so let’s just say it’s safe to assume it’ll hold air like it should. 87/100 is the final grade this mattress got for its built-in pump. So, what do we get for the money invested? All of our ratings combined came down to a single number for the price-quality ratio. It’s 87/100. We know that doesn’t seem like much compared to SoundAsleep Dream Series mattresses, for example, but it holds spot No.3 for a reason, trust us. We know you’ll feel inclined to compare these 3 mattresses forwards and backwards, but you really shouldn’t. They’re all different products with different strengths and weaknesses. OK, we all know SoundAsleep Dream Series doesn’t have any weaknesses. This Coleman air bed is well-known for its amazing air retention, and, naturally, that’s the category it got the highest grades in. People have reported it went for months without a refill. It had lasted for about two weeks in our testing setup before we had to add some air. It’s also very durable, and convenient due to its elevated construction. Some buyers prefer steel frames rather than just the mattress being raised. It comes down to personal affinities basically. We don’t have a category where we grade appearance, but if we did, this air mattress would be king of sleek and elegant design. Sounds simple enough when you don’t see what’s happening behind the curtain, but we love it! So, crunching boring DATA in order to boil it down to a single number for you is what 3Beds is all about. Since we did our little explaining bit, we can start introducing the top-rated air mattresses for this update. What happened in this update? It was a grind right until the very end. It’s only fitting that our 10th update brings along some NEW and INTERESTING development, which is exactly what happened. Well, at least, in the 2nd and 3rd place. 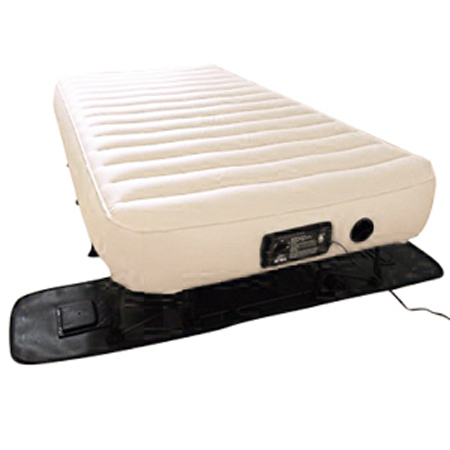 The last update featured SoundAsleep Dream Series air bed as the winner. What a shocker (not!). Same thing two months later, king of the hill, moving on. The really interesting bit starts at place number 2. Last time we had Insta raised air mattress, which is completely gone this time around and replaced by Fox High Rise. The same goes for Serta raised air mattress with never flat pump. It was 3rd last time around, only to be replaced by Coleman Queen airbed with cot. There’s a simple explanation for this type of events. The mattresses are “battling” it out almost evenly on all fronts, and the number of last-minute sold copies and reviews decides the winner. Notably, models have to be pretty evenly matched for the sheer number of photo-finish reviews to make a DIFFERENCE, but it happens more often than you might imagine. Anyway, that’s one slippery slope right there. More reviews mean more user grades in different fields, but also a bigger divider for CALCULATING the average grade. That’s a natural fail-safe mechanism in our user-oriented part of the story. If the grades were bad and the divider kept on increasing, this model would plummet off the face of the Earth. That obviously didn’t happen here, which is the first INDICATOR of some top-quality air mattresses. So, we got back to the drawing board and decided NUMBERS never lie. So, we kept it neutral, as 50-150 dollars. We’re not sure why we just shared that, we though it might put the prices into perspective. SoundAsleep Dream Series sir mattresses rid a lot of categories of EXCITEMENT. Their Queen Size has been dominating this guide for over a year now, and this trend will surely continue based on the ratings in front of me. The REAL battle is fought for places 2 and 3. Fox High rise and Coleman Queen took those positions by storm. Their sales increased dramatically, and that was enough to beat Insta and Serta models. The follow-up article and video about our testing sessions with these mattresses are due for publishing, and you should expect them shortly. Enjoy all the new reviews and technical data until the new update. See ya in exactly two months.